A cohort of dynamic and innovative teachers of grades K-12 participated in their first weekend field experience at the Pocosin Lakes and Mattamuskeet National Wildlife Refuges as part of a fellowship program offered by North Carolina Museum of Natural Sciences to facilitate project-based learning (PBL) in the classroom. 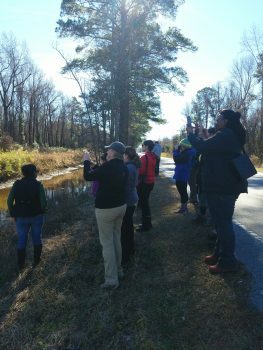 The educators visited the Pocosin Lakes on Jan. 5 and trekked through the Lake Mattamuskeet Watershed on Jan. 6 as part of a field trip led by Michael Flynn, coastal advocate for the North Carolina Coastal Federation. Michael first met Melissa Dowland, coordinator of teacher education for the museum, two other staff members, four mentor teachers and 17 PBL fellows at the Mattamuskeet Visitors Center where he provided an overview of the development process for the recently completed Lake Mattamuskeet Watershed Restoration Plan. Afterward, the group walked over to the Mattamuskeet Lodge, and learned that it was originally constructed as the world’s largest pumping plant in support of audacious ventures to farm the lakebed between the 1900s and 1930s. 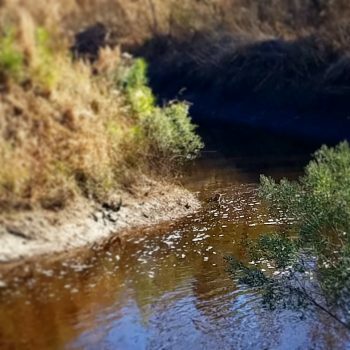 The excavation of the outlet canals that accompanied the farming endeavor was reviewed, and the current conditions of the canals were summarized as part of a discussion about inadequate drainage capacity and frequent flooding that occurs in various hotspots throughout the watershed. The group piled back in passenger vans and drove north on NC-94 to the next stop along a culvert located in the middle of Lake Mattamuskeet. The discussion at this location highlighted how the construction of the causeway for NC-94, which was completed in 1942, essentially divided the lake into an east and west basin. That talking point was used to transition into a conversation about how monitoring efforts first identified a loss of submerged aquatic vegetation (SAV) in the west basin in the mid- 1990s prior to the loss that occurred in the east basin beginning in 2014. The educators on the field trip also learned about the decline in water quality within the lake that eventually led to the listing of Lake Mattamsukeet on the state’s 303(d) list of impaired waters in 2016 and initiated the development of a watershed restoration plan. Michael described the three goals of the plan to protect the way of life in Hyde County, actively managed the lake water level and restore water quality and clarity before the group drove to the final stop of the field trip. The tour concluded at the intersection of NC-94 and Boundary Canal where the pump station for the Fairfield Drainage District has operated since 1958. The purpose of this final site visit was to discuss the fact that the boundaries of several drainage management entities are adjacent to the Lake Mattamuskeet watershed and could serve as a mechanism to implement active water management and facilitate sheet flow applications after site suitability and feasibility are evaluated through engineering studies. In addition to learning about water management and water quality issues in northeastern North Carolina the educators observed and identified waterfowl, spotted a bald eagle and took pictures of a playful river otter all while contributing to discussions about how to incorporate environmental education into the classroom. Learn more about Lake Mattamuskeet at nccoast.org/lakemattamuskeet. Visit pblfellows.naturalsciences.org to learn more about PBL fellowship program.